Sew on labels are a great choice for durability. Though sewing labels into garments takes a little longer and requires a tad more patience! Sew on labels can also be great if you want to attach your label into a seam, or as a loop so you can hang your garment from a hook. 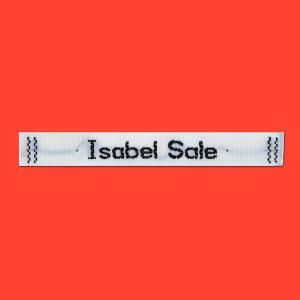 We have two different kinds of Sew on labels: Printed Sew on labels and Woven Sew on labels. Our printed Sew on labels are made from the same long lasting nylon fabric as our Iron on labels. They were bought into the range for people with sensitive skin, as once washed they become silky smooth. You can also trim these labels to your ideal size without worrying about the edges fraying and they don't fade. These labels are quicker to produce than our woven labels, and can even be posted out the same day (if ordered before 2pm weekdays). A Lifetime Guarantee provides piece of mind.